Born on November 19, 1917 in an illustrious family, Smt. Indira Gandhi was the daughter of Pt. Jawaharlal Nehru. Being academically inclined, she studied at Ecole Nouvelle, Bex (Switzerland), Ecole Internationale, Geneva, Pupils' Own School, Poona and Bombay, Badminton School, Bristol, Vishwa Bharati, Shantiniketan and Somerville College, Oxford. She was conferred Honorary doctoral degree by a host of Universities such as Andhra, Agra, Bangalore, Vikram, Punjab, Gurukul, Nagpur, Jamia Milia, Poona, El Salvador of Buenos Aires, Waseda of Tokyo, Moscow State, Oxford, Charles of Prague, Mauritius, Baghdad and the U.S.S.R. With an impressive academic background she also got the Citation of Distinction from the Columbia University. Smt. Indira Gandhi was actively involved in the freedom struggle. In her early childhood she founded the Bal Charkha Sangh and in 1930, the 'Vanar Sena' of children to help the Congress party during the Non-Cooperation Movement. She was imprisoned in September 1942, and worked in riot-affected areas of Delhi in 1947 under Gandhiji's guidance. She got married to Feroze Gandhi on March 26, 1942 and had two sons. Smt. Gandhiwas a Member, Congress Working Committee and Central Election of the party in 1955; Member, Central Parliamentary Board of Congress, 1958; Chairperson, National Integration Council of A.I.C.C. ; President, All India Youth Congress, 1956 and Women's Dept. A.I.C.C. ; President, Indian National Congress, 1959-60; and Indian National Congress from January 1978. From 1964 to 66 she was the Minister for Information and Broadcasting, Government of India. Then she held the highest office as the Prime Minister of India from January 1966 to March 1977 and again from January 14, 1980. Concurrently, she was the Minister for Atomic Energy from September 1967 to March 1977; and Minister for Space from June 1972 to March 1977, and from January 1980 was Chairperson, Planning Commission. From 1966-1977 she was the President of the Council of Scientific and Industrial Research; and Chairperson, Hindi Salahkar Samiti. She held the additional charge of the Ministry of External Affairs from September 5, 1967 to February 14, 1969; Ministry of Finance from July 16, 1969 to June 26, 1970; Ministry of Home Affairs from June 1970 to November 1973; Ministry of Information & Broadcasting from March 1971 for a while; and Ministry of Defence from January 1980. Smt. 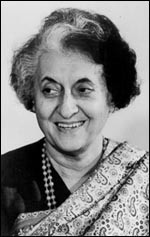 Indira Gandhi was associated with a large number of organisations and institutions, some of which are: President, Board of Trustees of Kamala Nehru Memorial Hospital; Trustee, Gandhi Smarak Nidhi and Kasturba Gandhi Memorial Trust; Chairperson, Swaraj Bhavan Trust; Founder and Chairperson, Bal Sahyog, New Delhi in 1954; Chairperson, Bal Bhavan Board and Children's National Museum, New Delhi in 1955; Founder and President, Kamala Nehru Vidyalaya, Allahabad; Vice Chairperson, Central Social Welfare Board, 1953-57; Life-Patron, Indian Council for Child Welfare; Vice-President, International Council of Child Welfare; Patron-in-chief, Indian Council for Affairs, 1960; Patron, Foreign Students Association in India. She was Chancellor Visva Bharati University; Jawaharlal Nehru University and North-Eastern University 1966-77; Member, Delhi University Court; Indian Delegation to UNESCO, 1960-64; Member, Executive Board of UNESCO, 1960-64; Member, National Defence Council 1962; Executive Committee of National Defence Fund, 1962; Chairperson, Citizen's Central Council 1962; and Sangeet Natak Academy 1965-74. She was also a Member, National Integration Council; President, Himalayan Mountaineering Institute, Dakshina Bharat Hindi Prachar Sabha; Nehru Memorial Museum and Library Society and Jawaharlal Nehru Memorial Fund; Patron, Indian Society of International Law. After having held such important positions, she also became a Member, Rajya Sabha, August 1964-February 1967; Member, Fourth Lok Sabha 1967-71; Fifth Lok Sabha 1971-77; and Sixth Lok Sabha during November-December 1978. She was elected to the Seventh Lok Sabha from Rae Bareli (U.P.) and Medak (Andhra Pradesh), January 1980. She chose to retain the Medak seat and relinquished the Rae Bareli seat. She was chosen as the leader of the Congress Parliamentary Party in 1967-77 and for the Congress Parliamentary Party from January 1980. She found recreation in whatever she did and equal relaxation in being close to nature, in different forms of art, in physical activities like hiking in the mountains, or even reading about an unfamiliar subject. Interested in a wide array of subjects, she viewed life as an integrated process, where activities and interests are different facets of the whole, not separated into compartments or labeled under different heads. She had many achievements to her credit. She was the recipient of Bharat Ratna, 1972; Mexican Academy Award for Liberation of Bangladesh 1972; 2nd Annual Medal, FAO, 1973; Sahitya Vachaspati (Hindi) by Nagari Pracharini Sabha, 1976. She also received Mothers' Award, U.S.A., 1953; Islbella d'Este Award of Italy for outstanding work in diplomacy, Yale University's Howland Memorial Prize; for two consecutive years in 1967 and 1968 was the woman most admired by the French according to a poll by the French Institute of Public Opinion. According to a special Gallup Poll Survey in U.S.A. in 1971 she was the most admired person of the world and Diploma of Honour was conferred by the Argentine Society in 1971 for the Protection of Animals. Her famous publications are The Years of Challenge 1966-69; The Years of Endeavour 1969-72; India (London) 1975; Inde (Lausanne) 1979 and numerous other collection of speeches and writings. She travelled widely in India and all over the world, paid official visits to many countries such as: Afghanistan, Algeria, Argentina, Australia, Austria, Bangladesh, Bhutan, Belgium, Brazil, Bulgaria, Burma, Canada, Chile, China, Czechoslovakia, Bolivia, Egypt, France, German Democratic Republic, Federal Republic of Germany, Guyana, Hungary, Iran, Iraq, Italy, Indonesia, Japan, Jamaica, Kenya, Malaysia, Mauritius, Mexico, Nepal, Netherlands, New Zealand, Nigeria, Oman, Poland, Romania, Singapore, Sri Lanka, Switzerland, Syria, Sweden, Tanzania, Thailand, Trinidad and Tobago, U.A.E., the United Kingdom, U.S.A., U.S.S.R., Uruguay, Venezuela, Yugoslavia, Zambia, Zimbabwe and United Nations Headquarters.